Blood clots kill more people each year than cancer and HIV/AIDS combined. I therefore find it amazing that in the UK there is almost zero publicity relating to the issue, especially given that we have a freely available health service (NHS) whose job it is to attend to the nation’s health and that treatment and prevention of them is so simple and straightforward. Perhaps reading this assertion over the severity of the effects of blood clots you think I exaggerate. Maybe you are more familiar with reading about strokes (a blood clot in the brain), or heart attacks (many of which are caused by blood clots in the arteries supplying blood to the heart). The type of blood clot I suffered, a Pulmonary Embolism (PE), is fatal in roughly one third of cases yet is easily preventable. Indeed it is a fact that almost all blood clots are easily preventable and the costs of prevention far outweigh the price of curing the after effects of having one, assuming you survive that is. Preventative drugs, such as Heparin and Warfarin, are relatively cheap when compared to many newer drugs, yet are frequently not employed, at least in the UK. 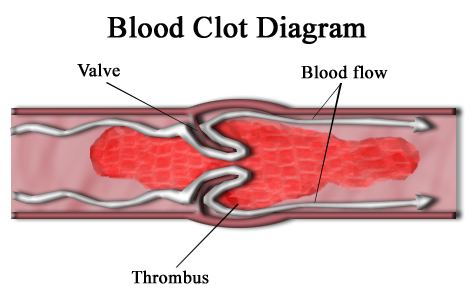 If you are diagnosed with a clot, or at high risk of one, I would encourage you contact your GP and attempt to ensure that you are not passed over for what is a simple and cheap preventative measure. Doing so could save your life. Some people believe that blood clots only happen to the elderly and to some extent that belief is justified however it is not the whole story. 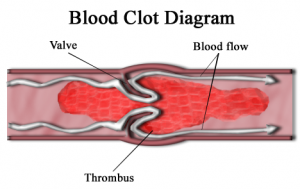 There are a number of risk factors that can increase your risk of having a blood clot, but even if you have none of these risk factors one may still occur – as happened in my own case. Only yesterday a Premiership footballer, Bolton’s Gary Cahill, was diagnosed with a blood clot. You don’t get much younger or fitter than this. So now that I have shown you that anyone can get a blood clot, that they are serious enough to be life threatening and hopefully you are motivated enough to care…now what? Well, if you get a pain in a limb accompanied by swelling hopefully you will take it more seriously than I did – only going to the doctor after three days of being unable to walk due to what I thought was merely a bad cramp or muscle pull in my calf muscle. An early trip to the doctor could save your life, or at the least help you avoid a lot of pain and inconvenience. It is a great site for expanding knowledge of this subject and exploding a few myths. This entry was posted in Medical, Science and tagged blood clot, Bolton, Embolism, Gary Cahill, Heparin, NHS, Pulmonary Embolism, Warfarin. Bookmark the permalink.